We've all seen police service dogs diligently going about their job of keeping us safe, whether it's sniffing for explosives, drugs or weapons in luggage at airports or chasing down criminals and tackling them to the ground until their human partner catches up. It's what they are trained to do from the time they're young pups. It's all they know. But what happens to them when they grow older and are unable to move as swiftly? 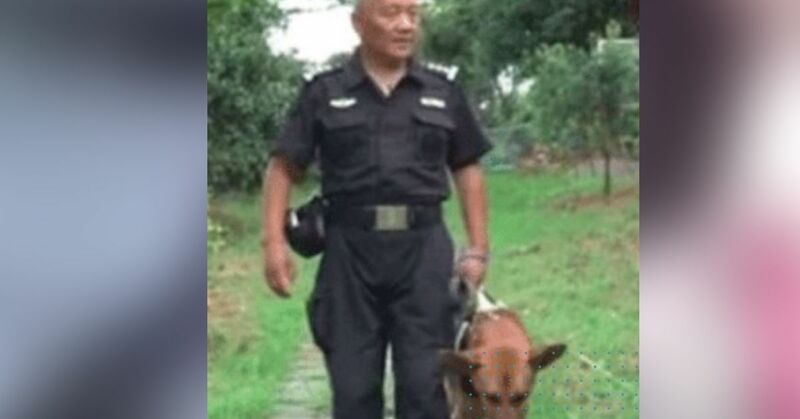 Chinese police officer Bai Yan worked with police dogs for 13 years, caring for 30 police dogs assigned to his unit in Zhejiang province in China. They became his family and developed a deep bond. When Bai reached retirement age, he began to realize that the service dogs also retired but for them it did not mean relaxing in their golden years. Trained to work, they were sometimes not suitable as pets and often faced neglect in their new homes. Or even worse – if a new home could not be found, they were simply put down. Bai decided he could not let that happen to his faithful companions. Instead, he founded a "retirement home" for the service dogs that gave them a new lease on life. With his own money, about $150,000, he designed the ideal dog retirement home, complete with assault courses, walking paths and activities to keep the dogs healthy and happy. Although many retirees wonder what to do with their lives, Bai has found a new purpose, albeit a familiar one. Feeding the dogs, exercising them and giving them lots of love come naturally to him. As the saying goes, "Do what you love and you won't work a day in your life." Bai and his retired police dogs are living that every day.